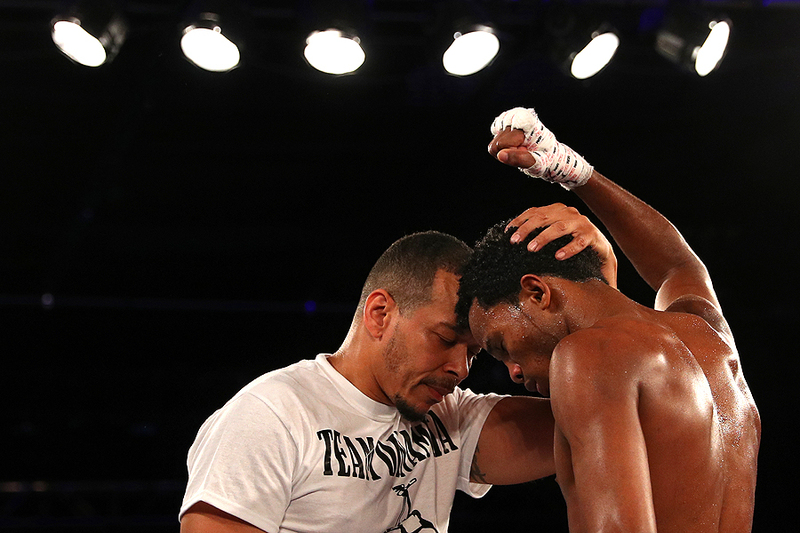 "Boxer Yueri Andujar (R) shares a moment with his trainer Sensei Guerrido after defeating Crystian Peguero (not pictured) in his pro boxing featherweight debut bout at 2300 Arena on September 14, 2018 in Philadelphia, Pennsylvania." Every time I speak to students wanting to get into this business of photography, one of the many pieces of wisdom I try to instill is that you never know what you'll have the privilege to visually document. A couple weeks ago, I found myself chasing a story in which I decided to shoot a couple of fights prior to what I was actually in the building for. Sometimes when I find myself in a situation like this - I think of the future. Will one of these athletes become a superstar later in life? Or will I never hear of them again? I hope for success for everyone. In one of the bouts, Yueri Andujar won his very first professional fights. But what moved me was the moment he had after with his trainer. Juxtaposing moments like these are powerful - it shows the quieter side to the physically demanding sport - which is something I'm always trying to show viewers.